LA JOLLA—The brains of some people with autism spectrum disorder grow faster than usual early on in life, often before diagnosis. 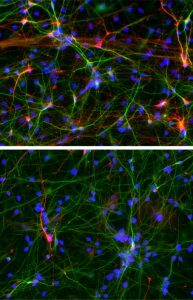 A new study co-led by Salk Institute scientists has employed a cutting-edge stem cell technique to unravel the mechanisms driving the mysterious phenomenon of excess brain growth, which affects as many as 30 percent of people with autism. 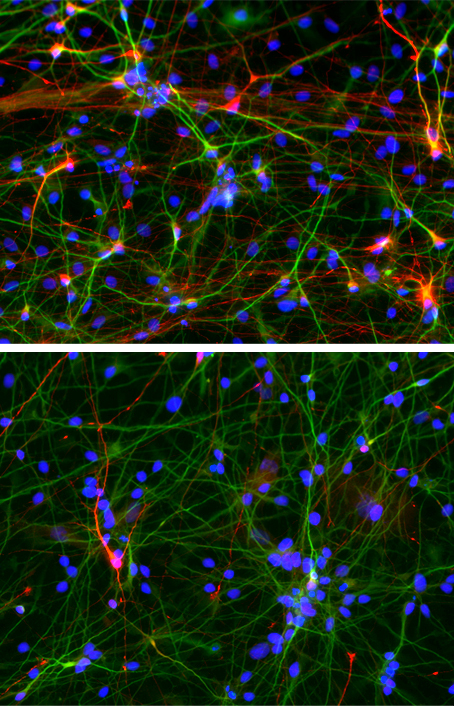 Researchers have turned the skin cells of people with autism spectrum disorder into neurons. These cells show specific defects compared with those neurons derived from healthy people, including diminished ability to form excitatory connections with other neurons (indicated by red and green dots in the neuron). Neurons derived from people with autism spectrum disorder, shown in the bottom panel, form fewer inhibitory connections, shown in the red stain, compared to those derived from healthy individuals (top panel). The total number of neurons that researchers were able to generate was about the same between the two groups. In 2010, Gage, Carol Marchetto of Salk’s Laboratory of Genetics, Alysson Muotri of the University of California, San Diego, and their collaborators showed they could recreate features of Rett syndrome—a rare disorder that shares features of autism but is caused by mutations in a single gene—in a petri dish. In the new study, collaborating with Muotri and other scientists at UCSD once more, Gage’s team created stem cells from a subset of people with autism whose brains had grown up to 23 percent faster than usual during toddlerhood but had subsequently normalized. 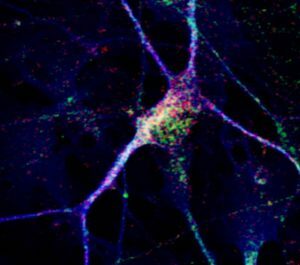 The neuron precursor cells derived from the patients multiplied faster than those of typically developing individuals. 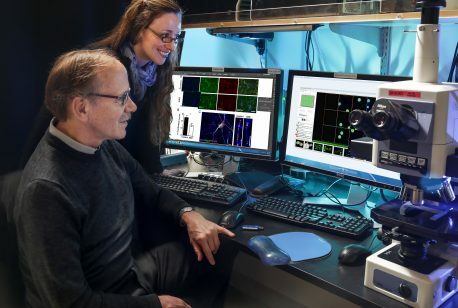 The finding supports a theory some experts have put forth that brain enlargement is caused by disruptions to the cell’s normal cycle of division, Marchetto says. In addition, the stem cell-derived neurons of individuals with autism behaved abnormally, bursting with activity less often compared with those cells of healthy people. Although the newly derived cells are far from patients’ brains, a brain cell by itself may reveal important clues about a person, Marchetto says. “It never fails to amaze me when we can see similarities between the characteristics of the cells in the dish and the human disease,” she adds. Other authors on the study are Haim Belinson and Anthony Wynshaw-Boris of the University of California, San Francisco; Yuan Tian, Jing Ou, and Daniel Geschwind, of the University of California, Los Angeles; Beatriz Freitas, Patricia Beltrao-Braga, Cleber Trujillo, Eric Courchesne, Cynthia Barnes, Karen Pierce, Lawrence Eichenfield, Tiziano Pramparo and Lisa Eyler of the University of California San Diego; Chen Fu of Case Western Reserve University in Cleveland, Ohio; Krishna Vadodaria, Ana Mendes, Yanelli Nunez, Himanish Ghosh and Rebecca Wright of Salk; Krishnan Padmanabhan of University of Rochester School of Medicine and Dentistry in New York; and Kristen Brennand of Icahn School of Medicine at Mount Sinai in New York.